Almost all of the drawings that I post here on my blog are based upon proportions. I like using proportions because it makes scaling a project far easier. I did the same with the Japanese Toolbox project. I approached this knowing that the height, width and length will be variable based upon need and as such would be impractical to constrain with proportions. Instead I concentrated on the peripheral parts of the toolbox. The proportions are based upon the thickness of the handle. It’s doubtful that I will ever alter the thickness of the handle enough to change the size of the other parts so proportions for this project are mostly an exercise in consistency. What I want to do now is explain how I work out the actual size of the elements based upon my stated proportions. In the lower left corner of the drawing you will find a “Module Scale”. The module (D) being the key starting dimension upon which all others are derived. For this project (D)=handle thickness which I will be making 36mm. The “Module Scale” simply shows this divided into proportional parts. In this case halves and thirds. Everything on the drawing is drawn to scale so that a pair of dividers can be set to a distance on the “Module Scale” and matched to a distance on the item drawn. The reverse holds true as well of course. So here is a breakdown of the derived dimensions. Hope that helps those of you who may be trying to make sense of my drawings. 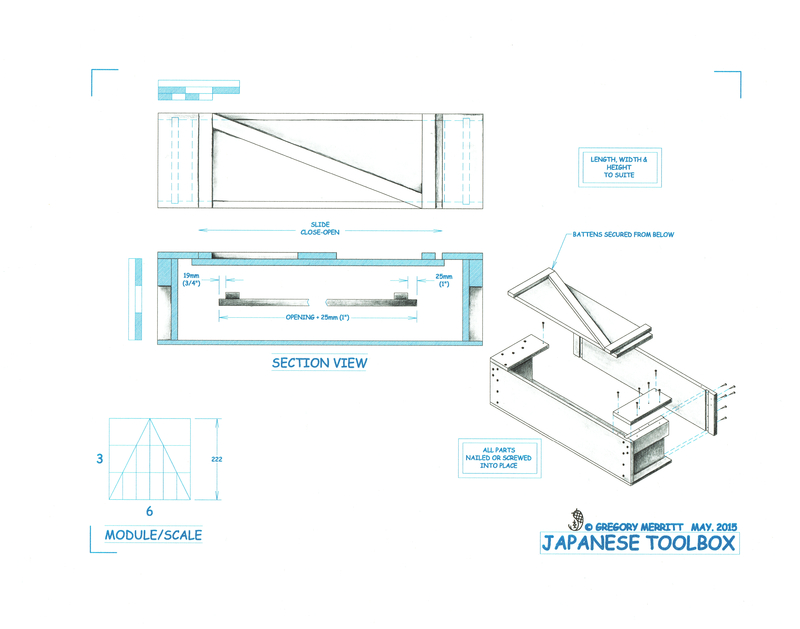 This entry was posted in Japanese Toolbox and tagged Design, Illustrating. Bookmark the permalink. Thank you for this blog. I really appreciate the time, thought, and effort you put into this. Hi Greg, I do the same thing subconsciously when I’m planning a project but never formally. I know that I play with the proportions until they look right to me, and if I adjust something I have to adjust all of the other parts to keep the appearance the same. My CAD software has a way to build this in as formulas for key dimensions, I’ll have to try that sometime just for fun. Yep, I’ve seen that build. It still seems too fussy for what this actually is. It would be a fun way to build one though.